One of the oldest technologies of artistic metal processing has found its continuation in modern furniture production. Without exaggeration, it can be said that the most common piece of furniture, made with forging, are beds. 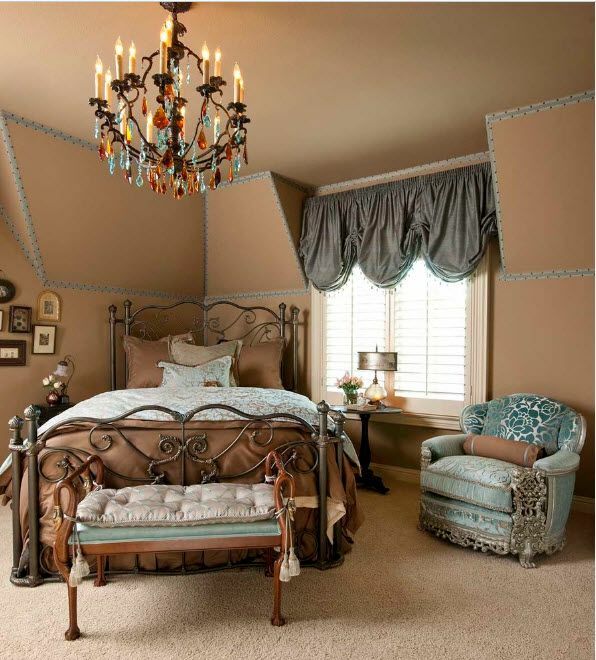 Luxurious, durable, elegant, wrought-iron beds can bring elegance even to the most ordinary interior. 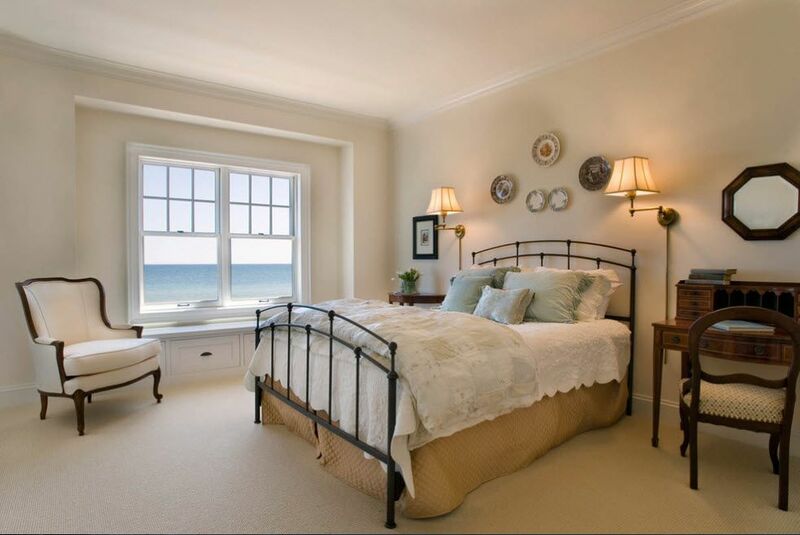 There is an opinion that forged beds are suitable only for classic interior design styles. Let’s try to debunk this myth on the example of a large-scale selection of photos with modern design projects of bedrooms with wrought-iron bed as a stylish and functional interior element. Skilled master can make out of such a hard and durable material as iron an openwork lace – an light (but only visually) product for interior decoration. It is noteworthy that in the case of wrought-iron beds, furniture fulfills its functions by 100%. It’s creates an European aristocracy, immediately becoming the accent of the interior, attracting all views. Many people associate forged products with the decoration of the palace, the rich dwellings of representatives of the nobility. Such things are appropriate for the layout of the bedroom in the modern world too. A wrought-iron bed can be organically entered into a neo-classical interior or as an accent in the ultramodern design of a sleeping space. Modern manufacturers of wrought-iron beds offer a wide range of models. Depending on the style of the bedroom, you can choose a bed with a multitude of delicate weaves and forged decor or a model with a laconic design with a minimal set of ornaments that can become part of a modern interior. You can find beds made of the combination of wrought iron with other materials (most commonly wood). 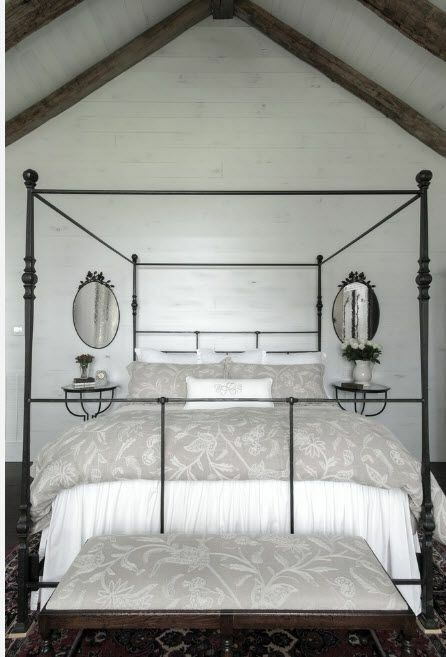 The wrought-iron bed is the undisputed leader in its segment. It is now the popularity of this type of furniture reaches its peak. Against the background of a rapid change in the situation, the high-speed rhythm of life, many townspeople want to fill the comfort and quietness at home. Smooth bends of forged products, ornate curls and the finest lace of forged decor can bring harmony to the bedroom interior and also they create an absolutely unique atmosphere. Whether it will be a luxury of the Middle Ages or a creative understanding of the present – it’s up to you. A bed with a forged frame will look good in any of presented below variants of the interior. Besides the incredible aesthetic qualities, wrought iron beds have quite practical advantages. These strong and durable items of furniture can serve you for many years, become a family heirloom and passed down from generation to generation. Ecologically clean forged products can be used by children and allergy sufferers without any risk (you only need to make sure there is no toxicity of the paint that the surfaces are covered with). Wrought-iron beds are safe and reliable. Among other things, such beds are not deformed. They are characterized by high moisture resistance. A hot way of processing the material involves heating the raw material to 600-700 degrees. A solid and strong metal becomes plastic, capable of taking the most intricate shapes. During hot forging both hand tools and a machine hammer are used. The hammer is necessary to form curved parts. Cast elements such as monograms, leaves and flowers are made under the press. The second way of metal processing is called cold, because it is carried out with the help of a stamping machine. Because of this, the second name of this method is stamping. The use of a stamping machine makes it possible to substantially reduce the cost of not only the production process, but also the final cost of finished products. Forged beds produced in a cold way are available to a wider range of customers. The beds with effect of antiquity are in great demand. A bit of rough surfaces with deliberately not painted parts look great in the interior of the style of Shabby Chic, Provence, Vintage. The effect of antiquity can be achieved only by manually painting the surfaces of forged products. 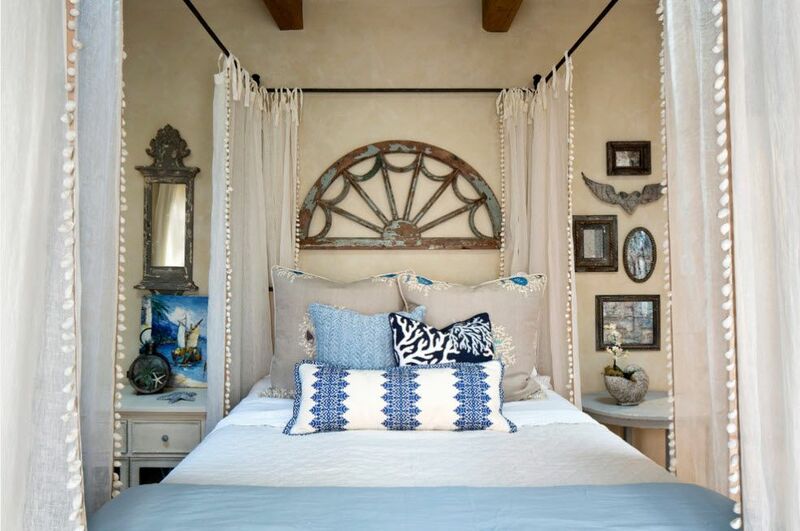 Designers use wrought-iron beds in various stylistic types of interior of the bedroom. 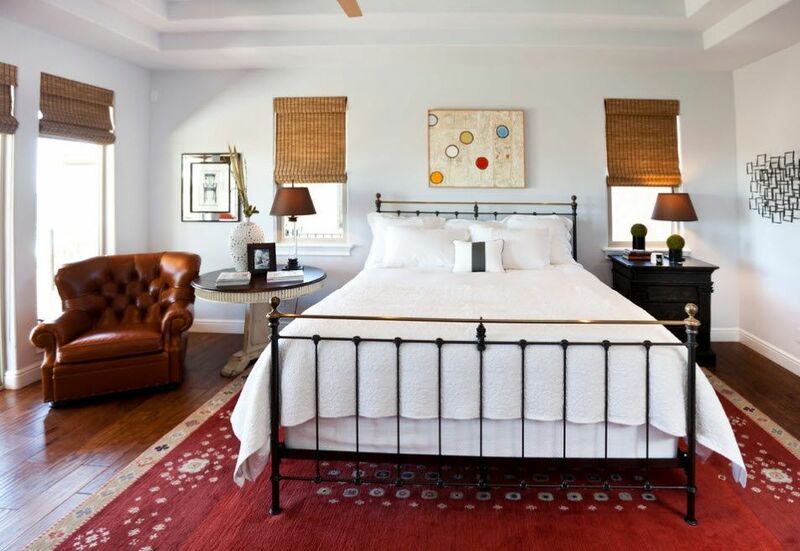 A wrought-iron bed with rich decor adds a touch of luxury and respectability in classic rooms. It brings comfort to the Country Style. Graceful curves of wrought headboards add softness and lightness to the image of the room in Romantic Stylistics and Provence. The aged surfaces of metal products will seamlessly fit into the style of Shabby Chic. Obviously, any classic styles are ideal for using a wrought-iron bed as the central piece of bedroom. 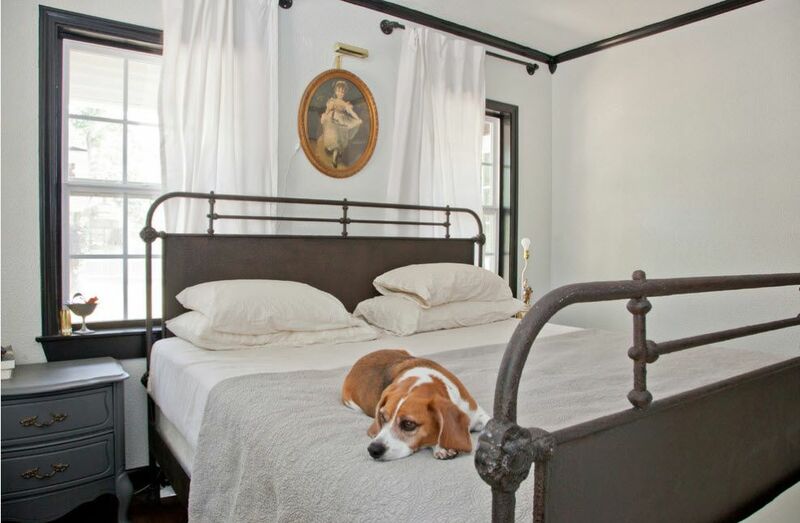 But a wrought-iron bed looks excellent in “modernized” adapted version of the classic too. 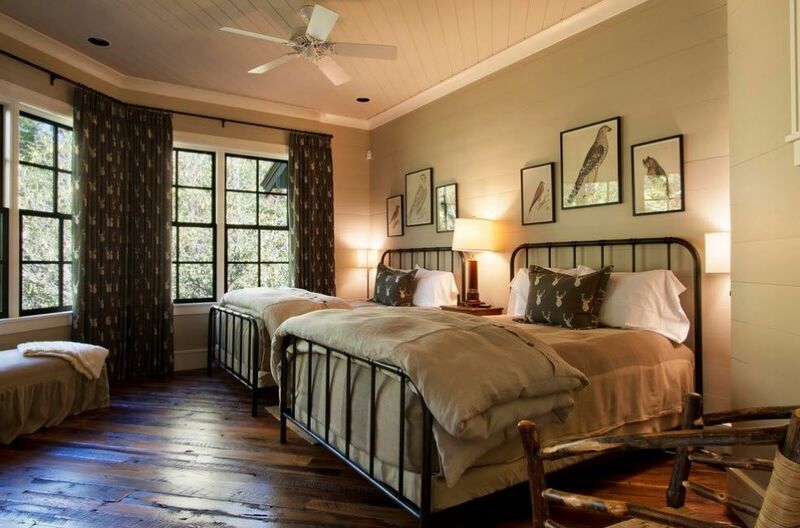 Bedroom in the neo-classic style will only benefit from the use of forging in the frame and / or head of the bed. There is no need to use very expensive models with a lot of decorative elements forged by hand. 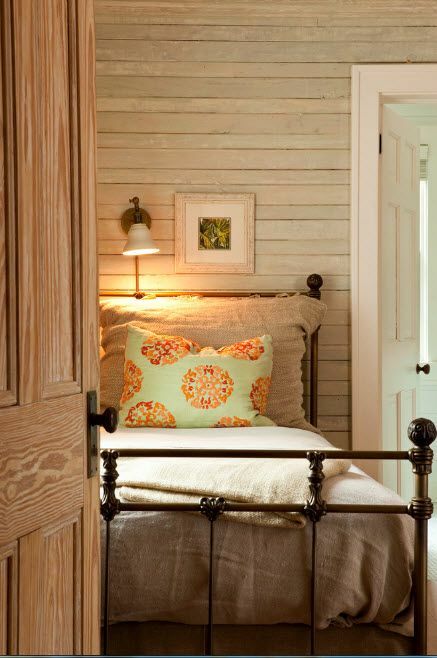 Wrought-iron beds with minimal décor are suitable for country style (almost any of its varieties). Metal combined with wooden elements looks excellent bringing a touch of coolness to the warm atmosphere of the room. To decorate a bed will suit fabrics in a cage, a small flower or single-colored versions of natural cotton, flax will suit. If you prefer modern style of decorating, you should choose forged beds with a laconic design. The reliability and strength of such item of furniture, its practicality and durability perfectly fit into the aesthetics of modern stylistics with its functionality and love of laconism. The simple design of the wrought-iron bed can also be used in Scandinavian style. Even for such a complicated style as minimalism, you can find a suitable bed model with a metal frame. 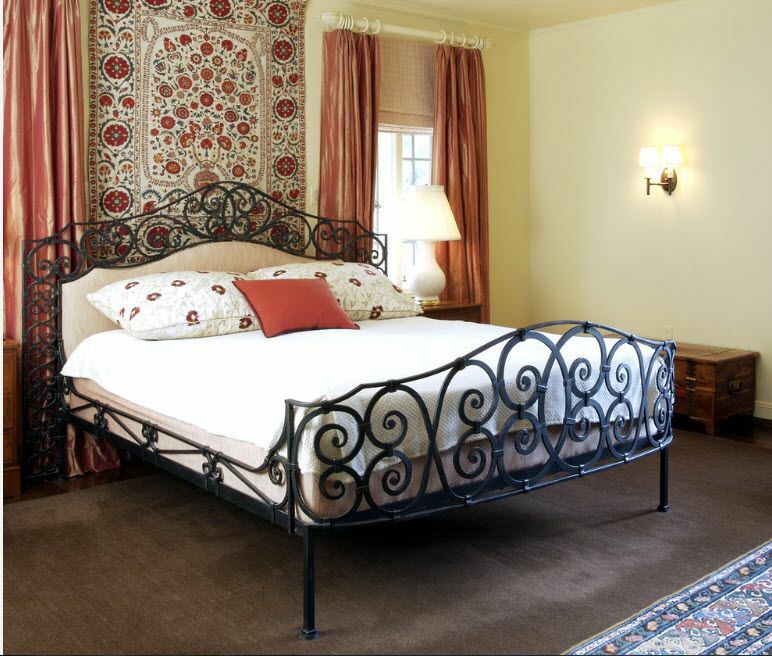 The bed with ornate forged decor is the perfect choice for a romantic interior design. Metal lace will perfectly match with the romance of sleeping space, expressed in delicate color solutions, pleasant fabrics, fine decor. 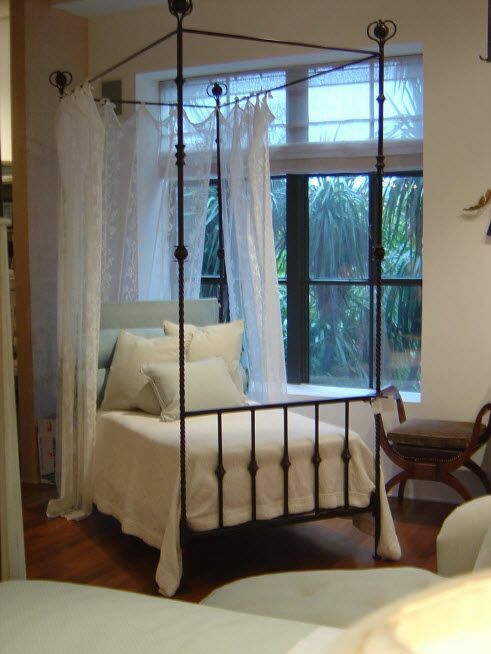 A wrought-iron bed is the most suitable option for a Shabby Chic style. After all, a metal furniture associates with family values, elements of the interior, passed down from generation to generation. 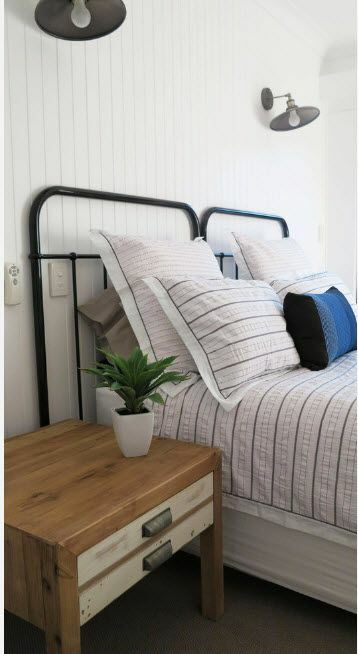 The bed can have a patina, a little peeling paint or not being painted at all – for the style of Shabby Chic this appearance will come in handy. Wrought-iron bed in white color is a universal option for various styles in interior design. 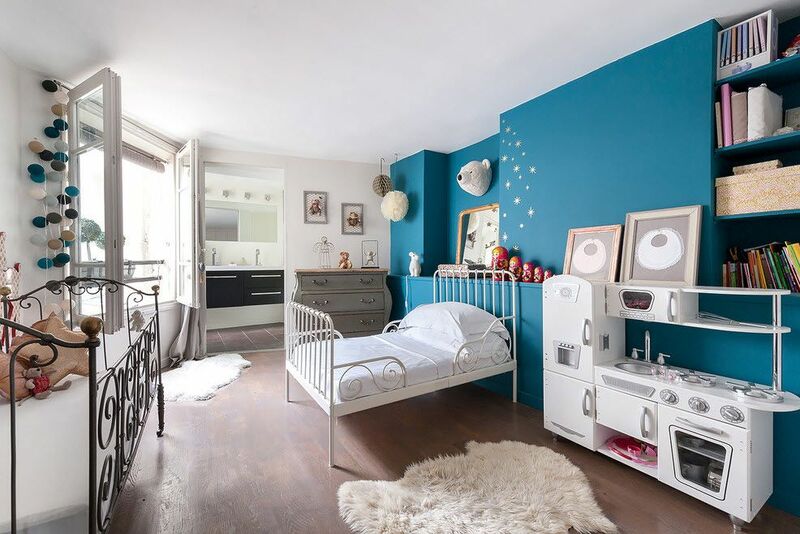 Even for children’s rooms, whose style can’t always be determined exactly, such furniture will be an excellent addition to the design. 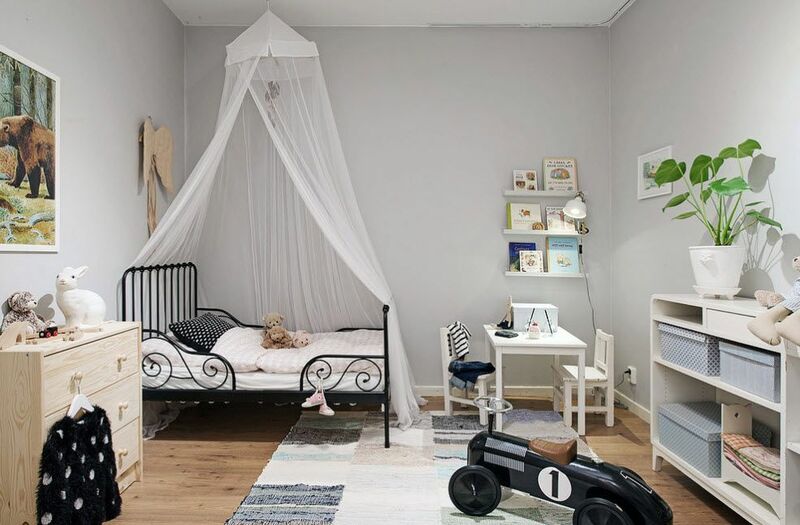 The white design of the bed can be used to create a harmonious environment in the light color palette of finishing the room or play in contrast, placing it on a background of a bright or dark surface. Choosing the black wrought-iron bed you should consider some features of interior design. Such a piece of furniture becomes the center of attention as the decoration of the bedrooms is mostly done in light, pastel colors. To create a harmonious image of the sleeping space, designers recommend to duplicate the black color in any other element of the interior – the design of the lighting fixture, wall decor, textile patterns or carpet. Forged bed attracts the eye becoming the focal point of the interior. A piece of furniture painted in bright colors is completely “doomed” to be in the spotlight. It’s enough one such piece of furniture to create a non-trivial image of the bedroom. 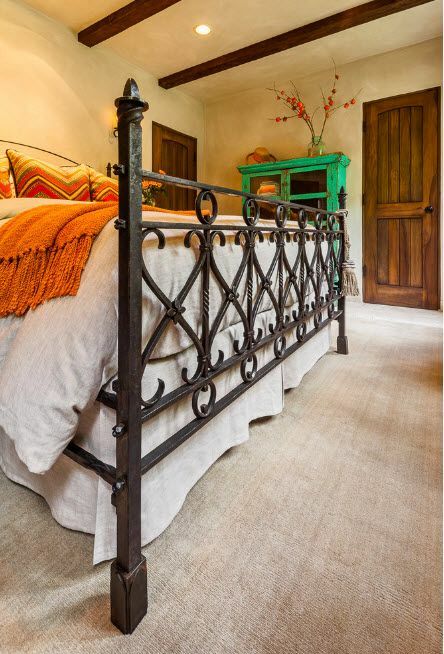 A wrought-iron bed painted in dark or bright color can become an accent element of the interior. 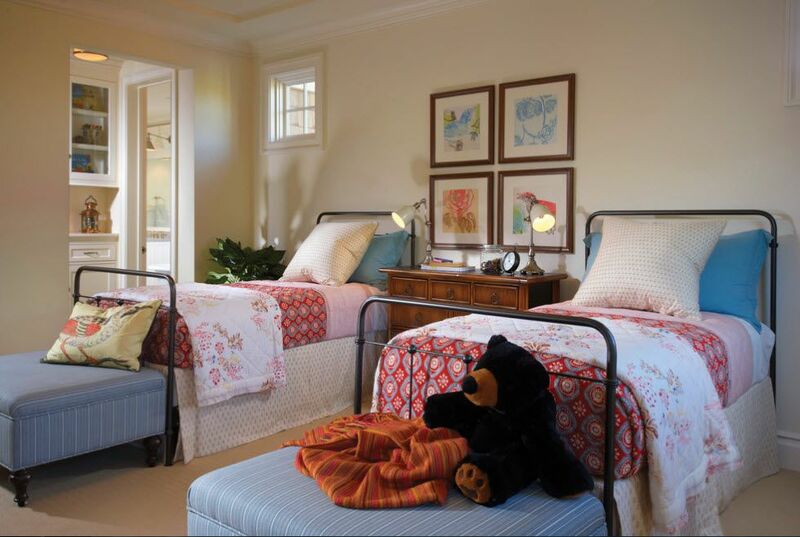 Especially since the sleeping segment always occupies a central place in the room. But often, the owners want to create a harmonious picture of the sleeping space, in which the bed (if it acts as a focal point) is combined with other elements of the interior. So, what can you combine with a piece of furniture made of forged metal? The most popular variant of combining elements of a bed with other objects of interior is combinatorics with the design of bedside tables-stands. Repeating forged decor on the headboard (and on the foot) of the bed in the design of tables or floors, you can achieve harmony not only in the image of the sleeping segment, but also the entire interior in general. 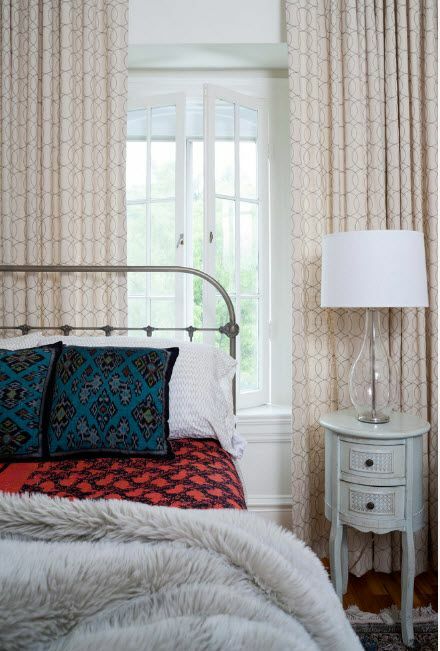 The second no less popular variant is a combination of forging as an element of bed with a design of lighting fixtures (central chandelier, wall sconces or table lamps). For the execution of the chandelier, imitation of forging is often used – the plastic elements are covered with special paint, sometimes artificially aged (the surfaces can imitate the patina). Another way to create a harmonious image of the sleeping room is a combination of forging on the frame and the head of the bed with curtain cornices. Even without the repetition of decorative elements within the design of window openings, only thanks to the material and the coloring of the forged products, it is possible to create not only organic, but also original images of bedrooms.